I’ve realized by the comments on my Perfect Waffle post that my actual go-to waffle recipe is hidden away in another post. Both involve yeast (of course– don’t make waffles without it! ), but my first recipe involves separating the eggs and whipping the egg whites right before making the waffles. Eventually, I found this tiresome on a weekend morning when I haven’t even had my coffee yet. So the recipe I actually use all the time involves combining all the ingredients and raising the batter in the refrigerator overnight. The waffles are still super crispy in the morning and you don’t have to bust out a hand mixer! Perfect for a pre-coffee bleary-eyed Saturday morning. Update: A friend had used “active dry” yeast in this recipe and it did not seem to rise correctly. When I refer to ‘instant’ yeast, it is actually the yeast that does not need proofing. If you are using active dry yeast, make sure to proof it first so it will rise properly. Combine and whisk together the dry ingredients in a large bowl: flour, yeast, sugar and salt. Combine the melted butter and milk. Add the mixture to the dry ingredients. Whisk eggs and vanilla together in a separate small bowl. Add the egg-vanilla mixture to the other mixture, and whisk until well-combined. Prepare waffle iron as usual. Stir the batter to deflate it (it should be puffy and frothy). Add to waffle iron the same way you would other batter, keeping in mind that this batter will rise more than batters that use baking powder instead of yeast. I’ve never thought of making waffles using yeast instead of baking powder, but this sounds like a recipe that will be perfect for me. Easy and lovely is a winning to combo. What an amazing looking waffle. I’ve never actually made a leavened waffle. I can’t wait to make these. These are the best waffles I have ever tasted, much less made. Thank you so so much! I used dry active yeast. I proofed it first using the yeast, sugar & warm milk (it took about 10 minutes & was very frothy on top when done). Also, instead of waiting overnight, I rose the batter over a bowl of hot water for about 40 minutes. They turned out great! When I actually think ahead far enough, I will try the overnight method to raise them. My kids & wife loved them too. Thanks again! I bought the waffle iron at Williams-Sonoma. 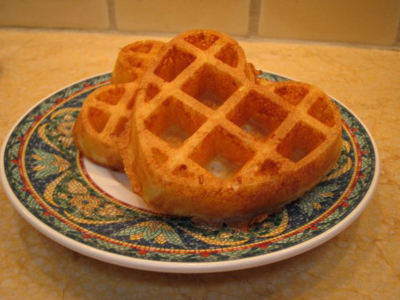 I don’t think they sell it anymore, but just do a search for Villaware Petite Heart Waffle Iron and it should turn up. Good luck! Hi there rk — It depends on your waffle maker. For us, this recipe feeds 4-6 people easily. (My main waffle maker makes mini-waffles, so it is a bit difficult to judge.) What kind of waffle-maker do you have? Tried both your waffle recipes. LOVED THEM BOTH. I too thought that I was the lone waffle freak! Thanks so much for posting these infallible recipes. Thanks Portia! Glad you liked it. You have created the PERFECT waffle batter! I’ve been using it for over a year now after dozens of other dissapointing recipes. I use SAF Instant yeast and WAS using the waring pro belgian waffle maker. I recently splurged and bought the All-Clad waffle iron off of Williams Sonoma and OMG, your recipe with this waffle iron makes the worlds most superb waffles. I’ve had waffles in the best hotels in the world but none came close to my waffles made today for my husband. He pouts when I don’t have your batter in the frig waiting for a fresh waffle in the morning. You would think that he would get bored of them, but he never does. One of my christmas presents this year from him was the 4 square All-Clad Waffle Iron because the waring pro was a pain, spillage over the edge, teflon wearing out (ok, maybe it was from overuse) but when I got the AC I realized that I thought was great didn’t compare to the waffles (your recipe + AC iron). I just wanted to thank you for sharing your recipes with the world. It makes my husband happy to wake up every morning. Not many people share their secret recipes with friends let alone the world. You did, and it has now become one of our families treasured traditions and recipes. Thank you! what flour do I use self rising all purpose ? It’s all-purpose flour. Sorry for the lack of clarity! Hi, I have had your website saved under favorites after doing a search for crispy waffles about a year or two ago. I would always forget about it since you have to make it the night before. Until yesterday! I remembered to make the batter last night and this morning had the most amazing waffle ever! I couldn’t believe how good they were! Who knew yeast would make such a great difference! I am so happy to have found your recipe! Thank you so much for sharing! I can’t wait to make these for everyone! If the way to a mans heart is through his stomach, I will have them lined up around the block with these! Thanks! Thanks Stephanie! So glad you liked the recipe. If I see a line wrapped round the block next time I’m in Seattle, I’ll know why. Hi n thankx for sharing. Very anxious to try your recipe. Got a coulpe questions though… If i add in a little cornmeal will that foul up ur recipe? i ask bczz i’ve always liked the taste of it in waffles. And do you think theres any difference if i try buttermilk…. without the cornmeal though.? N if i do is baking soda necessary? I haven’t tried cornmeal in a yeast-raised waffle before, but I assume that it will be just fine if you replace a bit of the flour with cornmeal. I wouldn’t use buttermilk in this recipe — the reason buttermilk combined with baking soda is used in standard recipes is that the buttermilk and soda act as a raising agent. Because this recipe already has yeast, you don’t need additional raising agents. The buttermilk on its own, without neutralization by soda, may result in a more sour waffle. So I recommend sweet milk. i have a belgian waffle maker, will this recipe work in it? never been used,have had it for 3 yrs. time to break it in lol. Yes, it absolutely will work. Good luck breaking in the waffle maker! Finally–a truly crispy waffle! Thanks so much–deeeelish! This is exactly the recipe published in The Breakfast Book by Marion Cunningham in 1987, except that she has you add the eggs and 1/4 tsp baking soda the morning after preparing the batter. It has been my go to waffle recipe ever since. Now I found some pearl sugar so I want to try one of the olther recipes floating around the internet. I tried your recipe this morning. The waffles came out crispy on the outside, (hold them up to the light and you can see all the little baked bubbles on the edges) tender on the inside, and light as a feather. They came out better than the ones you can get at Bruxie here in Southern California. Thank you so much for sharing!